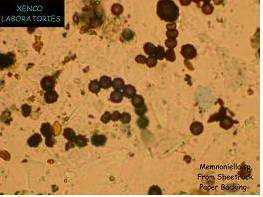 Memnoniella is a contaminant, found most often with Stachybotrys on wet cellulose. Forms in chains, but it is very similar to Stachybotrys and sometimes is considered to be in the Stachybotrys family. Certain species do produce toxins very similar to the ones produced by Stachybotrys chartarum and many consider the IAQ importance of Memnoniella to be on par with Stachybotrys. Allergenic and infectious properties are not well studied. Allergen not studied. Potential opportunist or pathogen not known. It has potential toxic production. Trichothecenes (trichodermol and trichodermin) and griseofulvins. Trichothecene toxicity is due to the ability to bind ribosomal protein. Griseofulvin has been made commercially available as an anti-dermatophyte drug. Mode of Dissemination: Dry spore carried by the wind. >Caldern-Garcidue?as, L., Delgado, R., Calder?n-Gardue?as, A., Meneses, A., Ruiz, L.M., De La Garza, J., Acuna, H., Villareal-Calder?n A., Raab-Traub, N., Devlin, R., Malignan neoplasms of the nasal cavity and paranasal sinuses: a series of 256 patients in Mexico City and Monterrey. Is air pollution the missing link? Otrolaryngol. Head Neck Surg. 122 (2000) 499-508. >Freire, F.C., Kozakiewicz, Z., Paterson, R.R., Mycoflora and mycotoxins of Brazilian cashew kernels. 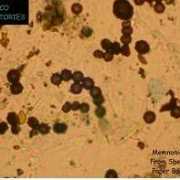 Mycopathologia 145 (1999) 95-103.